Looks great but can't possibly sound right, even if, as I suspect, it sounds good. Nothing a creative sound system might not overcome! "To reach the sound of the original P-51 Mustang there will be a sound system available to generate the original sound in the ultralight Mustang. This device will be controlled by the engine controls and provides an absolutely original sound from starting the engine, the acceleration and the stopping sound of the engine." Right or wrong, it probably sounds better. An LS3 V-8 vs a V-12? 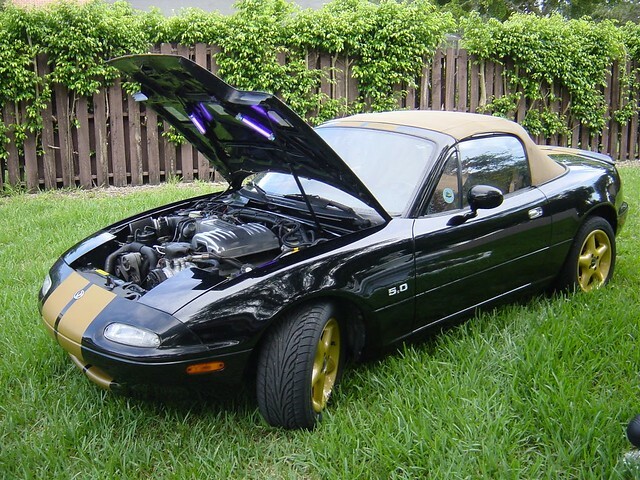 And why do folks insist on throwing LS3s in everything from Miatas to this? Story is that the original motor pranged badly, a previous owner went to a cast iron 350 Chevy motor and a Porsche 914/6 transaxle but couldn't get it past the smog wardens, so it sat until the current owner purchased it at a bargain basement price and did the transplant the right way - LS3 w/ emission legal upgrades, ZF transaxle rated to 600 ft lbs. 2600 lbs wet. no driver, 440 HP at the rear wheel w/ almost 500 ft lbs torque. As good as it goes, the sound isn't important, and even though he'll never get his investment back he'll have a ripping track day car that's street legal - no easy feat in California for any modified emission controlled vehicle. Smaller and cheaper seems to be something that a lot of people overlooked. The assumption was that things would get bigger and more expensive as they became more powerful. I enjoy reading old science fiction with massive "advanced" technology. In Vonnegut's "EPICAC", a building-sized computer received text input as the numbers 1-26 typed into a keypad, and produced text by printing the same numbers on a paper tape. In an EC Comics story I remember, an interstellar military produced a space fighter with an onboard AI computer, which amazed the pilot because "every electronic brain I've ever seen was the size of a building." In a way the supercomputers do still take up vast buildings, think of Amazon's cloud compute services, huge data centres and so on. I'm no LS fanboy and have been a Ford guy forever, but the LS series has a whole bunch of good features that lend themselves to high performance applications across the board. Durability - you have to either neglect it or throw excessive amounts of boost or nitrous on one to kill it. Availability and affordability. You can pick up the LS 1 just about everywhere on the cheap, and the 5.3 cast iron versions used in trucks are dirt cheap and are suitable for performance use with the right combination of factory parts - it's possible to put together a 5.3 version for under a grand. Because of the engine management system, it lends itself to supercharged/turbocharged applications. The all-aluminum versions have the added benefit of knocking off serious weight off the front end if it's used to replace an iron block V8. WRT the Countach my buddy built, using the LS motor permitted him to bring a dead car back to life and because the engine uses the appropriate emission controls he was able to register the car for street use. It also is significantly more powerful than the original Lambo motor. I have a list, but I'm not interested in defending it. I can sort of understand the purist argument, given the undoubtedly wonderful exoticism of the Lambo engine, and its undoubtedly unique sound, etc. But I can also understand the decision to so something with the car within one's own lifetime and actually getting to use it. I've known a few people for whom the old motto "the perfect is the enemy of the good" applies, and always figured perhaps they'd have been better off settling for something that actually works. I agree. Many years ago I had a co-worker who had somehow acquired a high-end Mercedes, but the engine soon failed on him and he couldn't afford to fix it -- it would have cost more than the value of the car even after it was fixed. I was thinking "are there no small-block Chevies?" Why bother having a Mercedes, if you're not getting the Mercedes engine along with it? Both have their good points, the V8 rumble against the V12 scream. It would not be my personal choice, but good on him to keep a Lambo running. Similar issues with Jaguars of certain vintages. Motor fails and the owner would transplant a Chevy or Ford V8 and the appropriate automatic trans. There was even an XKE coupe around locally that the owner transplanted a big block Chevy into - bright red with chrome sidepipes, huge flares all around with tires and rims to match. To me it looked like a cartoon version of a Cobra Daytona coupe. I've never seen the thing in action on the street or track so how it worked together I have no idea. As far as the purist argument, there's much to be said about value, historic and monetary, and utility. In the American tradition of hot-rodding, anything goes. If you take a dead Caddy and rebuild it to your taste with modern parts (even Cadillac parts) you are sub-human. My friend who has built a beautiful custom '49 Caddy has been on the receiving end of some pretty vicious criticism after he brought his Caddy to Reno during the C-L club carshow in conjunction with the Hot August Nights show, and the car he built for his his son (paraplegic) hand-controlled 1968 Caddy convertible with Corvette front suspension, a Caddy CTS-V supercharged LS motor, 9" Ford rear-end, air suspension etc. was subject to the same. The other attendees weren't so critical, and his son's '68 has won a few awards at shows here and there, so people do dig how the finished product came out. Last edited by BStrong; 14th April 2017 at 06:32 AM. Monster Miata. 5.0 liter Ford V8, T-bird transaxle. Amazing at how well everything fit. It was a real hoot and attention-getter. Looks like an update of the Sunbeam Tiger. I knew someone who had one of those. A 260 V8 in a little British sports car. He said, don't think of it as a regular car. It's an engine on wheels. Our former mayor, Willie Brown, bought an early Miata and liked the car, but not the power. He had a local shop put a Ford 5.0 and 5 speed into the thing. I've checked one out from behind the wheel. It could go on a diet at the front end but it ran hard. I used to dream about doing a Cosworth Vega with a detuned F1 DFV V8. Yeah, they're just so much more powerful. Holley wasted ZERO time getting into the TBI market. Their systems turned a lot of dinosaurs into computer savvy rednecks. I was just out sprucing up my garden shredder and notice that it has a Marvel-Schebler carburetor on it, along with a Wico magneto. Hoo boy, I hope I never need parts for that. At some point long long ago I picked up a beautiful mint Edison-Splitdorf magneto in a tag sale junk pile. Unfortunately, it was for nine cylinders, and I never quite found a use for it, being habitually at ground level. How many carburetor manufacturers were there? Carburetors aren't that complex or specialized, it's basically just cast/machined metal. Which... describes most car parts. I suspect most carburetors were not made by carburetor-only manufacturers, they were made by auto parts manufacturers who make lots and lots of different parts. Those companies didn't lose their markets, they just shifted their production. But they have to do that on a regular basis anyways, including when they went from one model of carburetor (or any other part) to a newer one. Holley started making carburetors around 1904, and specialized in them until they were phased out in favor of fuel injection. Holley segued rather smoothly into the fuel injection market as that process occurred. Ford started using Holleys with the Model T, and basically stayed with them for the best part of a century. Weber started out in 1910 and was lasted until the 90s as well. Weber carbs are still being produced for classic racing, as well as replacement kits for OEM carbs that didn't work well. (And not just carbs. I had a '72 Volvo 142 with fuel injection that wasn't quite ready for prime time yet. The injectors went out like light bulbs when they failed, there was no good way to clear them when they clogged, or even check the flow rate, and the control unit was a (literal) black box under the front passenger seat that even the factory repair manual said to diagnose by replacing with a "known good unit" to see if it was the cause of a malfunction. S.U. also started out around the early in the 1900s, too, and lasted well into the 90s. The original firm is defunct, but products are still being made under that name for restoration and hobby use. GM set up Rochester Products as a separate division in the 30s which produced very little besides carburetors and shut it down in the 80s when they didn't need them anymore. There's three companies and a subsidiary which didn't produce much else aside from carbs for the best part of a century, until the technology phased out. And two of the three (Holley and S.U.) provided a significant portion of the carburetors in cars around the world for that time period. Rochester probably accounted for a lot of the rest. As far as them being simple is concerned, perhaps you are thinking of the principle they are based on. The actual operation can be a bit less straightforward. If you think they are that simple then you haven't rebuilt very many of them. Or tuned some of them (I'm looking at you, S.U. ). I happened to stop by a friend's just in time to watch him crank up his '65 Galaxie 500 after trying his first carb rebuild (a Holley, BTW), all on his own. He left a tiny retaining wire off of the float valve tang. The gasoline literally squirted up out of the top of the carb like a geyser. He said, "I wondered what those leftover parts were for. I thought they were just extras." There already were electronic calculators in 1967. I suppose they didn't predict hand-held ones that cost six dollars, run on solar power, and keep working for decades. Or, while costing a bit more, allow you to make phone calls and access the internet. Oddly enough, the HP48GX programmable calculator, which they quit making in 2003, currently sells used for not much less than I paid for a new LG Stylo smart phone less than two years ago. Pat of the reason for that is that they are coveted by surveyors all over the world who still prefer them to run the survey packages for their total stations. An entire industry was built around them for that purpose, and when HP quit making them the ones that were still being sold were snapped up and hoarded. There were some reasons for that attitude. 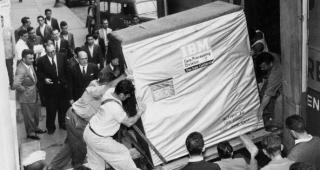 5MB IBM hard drive. 1956. That's an edelbrock based on a carter...WAY easier to work on than a Holley. 2 piece design, no gaskets below the fuel line, no power vavles, by far the easiest carb to work on, however, as your friend found out, there's still some tricks there! I recall rebuilding the Holley on my old Ford truck. A simple little single barrel job. Easy to do, hard to do right. Holy expletive deleted, what a piece of work. No wonder there was such a market back then for rebuilt carbs. I remember back in the dream time, rebuilding the Solex on my Peugeot 403. I sent off to J.C. Whitney for the kit, which cost something like $1.50, cleaned all up, ran like a top for years. I've had VW Solex carbs apart on the side of the road in the dark, tuned up hydraulic-damped themostatically regulated Zenith Strombergs that were as exotic as candied grasshoppers, but that damned Holley was a screaming primadonna! One of those little steel balls very few people even realize exist stuck in the accelerator pump circuit, and the muffler went red hot and exploded. I fixed that and then it wouldn't start. I fixed that and then it wouldn't idle. It got 25 miles to the gallon or 10. You'd never know which. That does look like a ball of fun. And it looks like a very clean install. You could have done worse, though. Aside from the absurdly complex Zenith Stromberg my old Saab 99* had, my main encounter with those was in extinguishing a Volvo one of whose Strombergs had backfired and caught the air cleaner on fire. However irritating an SU could be, it was a work of art compared to a Stromberg. I've seen a few clever throttle returns rigged with bicycle inner tubes. My first Jeep Cherokee had a bell crank throttle linkage that rusted onto the manifold and could not be fixed readily. For that, a screen door spring helped. Long ago I had a friend who got a VW Squareback in much the same way as you got the Volvo. The fuel injected Squarebacks were notorious for losing injection on half the engine, owing to bad wiring. Someone offered him one that ran on only two cylinders, and he said "are you sure? I cold probably fix it." The owner said if he fixed it he could have it, so he reached in, wiggled the bad connector, and drove off on all four. * added note: For the aficionados of strange old cars, I had a 1969 Saab 99. To begin with, although this was a US import, Saab dealers denied there was such a thing. The engine was a half a Triumph Stag, with a British Delco distributor for which no parts existed, a Zenith Stromberg carburetor with unobtainable small parts including a thermo-electric valve whose function nobody could explain, requiring a special damping oil that could not be obtained, a bicycle chain to run the overhead camshaft which was not adjustable, a manually operated switch on the engine preheater, which would cause vapor lock and stall above 50 degrees when neglected, unless it was raining, in which case it would ice the carburetor---It took almost a year to obtain replacement parts for the parking brake. A plastic heater duct cleverly defrosted the rear window until it warped and dumped all the heat between the front seats. The 69 version had a solid pan under the engine which when dented made it impossible to change the oil, and required you to remove the engine to tighten a leaky oil pan bolt. Not one of the great successes, but the thing went like blazes when it was running right, and could out handle anything in snow. Last edited by bruto; 18th April 2017 at 10:17 PM. Yep We must have been brothers in another life. Honda (or one of their suppliers) still makes them for their generators. Just got through overhauling the one on my EU2000i. It was starting to "lope" when I put it in economy mode. Fortunately, I sprung for the shop manual when I bought it, plus looked over scads of youtube videos on HOW to overhaul it (and combined the best hints out of all of them), so it only took a half-hour, of which ten minutes were spent fetching the correct tool(s). I'm off to the gas station to get some fresh gas and see if it runs. Good luck. I have faith in you! I've recently done the carb on my Snapper riding mower which would run with the choke on but not off. Pretty straightforward and absolutely filthy in there - surprised it ran at all. Also did the carb on a trials bike I just sold on eBay. Again, once you get in there, the problem is usually immediately obvious. Good advice is to take a lot of pictures at each stage - there's often more than one way some part can be installed. Seems we're over to carb anecdotes. Fine since the original topic was covered. At that time I learned about the function of the acceleration pump. I thought I had some carburetor trouble (Car: Hillmann Imp, and eventually, it turned out to be an ignition problem), so I had unmounted the carb and was looking into the venturi from the manifold side. I then operated the throttle valve, and the acceleration pump placed a nice squirt of gasoline right between my eyes. Must have done something right: the generator runs just fine now. Looking to add either a run-to-dry switch in the wiring harness, or a fuel shut-off valve in the carb fuel line so there's no fuel left in the system when I'm done. It's not rocket science, though it can feel that way at times. Running the fuel out of the float bowl can't hurt. Also, using ethanol-free gas is a plus, if you can get it. That's what goes in all my yard tools. The local small-engine service shop sells cans of "pure" gasoline: no additives, no ethanol. The problem is, they want five bucks a quart. I --MIGHT-- buy a quart as "putting-up" gas if I'm sidelining the genny for several months, but otherwise I'll stick with regular top-tier gas. For $20/gallon, I'll go run the genny for five minutes each week to keep the carb wet. I guess I'm lucky - the nearest gas station's premium is ethanol-free. Small premium over other stations, but not that much. I use it in all my yard tools and my little Light Sport airplane. Carburetors is now something for lawn mowers, small two-wheel rides, and such. What happened to all the carburetor manufacturers who suddenly lost most of their market? Perhaps they aimed their products at a more specialized market. Last edited by HghrSymmetry; 7th May 2017 at 08:53 PM. Many performance "lawn mowers" actually use two.